More and more, customer-centricity is becoming a thing. As in, an increasingly important philosophy to companies in managing day-to-day and even longer term planning. In comes in different forms: design thinking, social CRM, service-dominant logic, value co-creation. But it’s not pervasive at this point. Companies still are spotty on how much they integrate customers into their processes. This is a revolution that will take some time to unfold. Customers have thoughts? : For these firms, customers are transactions. How will I know if I’m attuned to the customer? I look at my daily sales receipts. If they’re up, I’m attuned. If they’re down, I’m not! Customers don’t know what they want: What was it Steve Jobs said again? Ah, yes: “A lot of times, people don’t know what they want until you show it to them.” Unlike the previous point on the spectrum, here, companies have considered that their customers have thoughts. They just don’t think there’s much point in paying attention to them. In a more charitable vein, Roberto Verganti cites companies that “make proposals to people”. While there’s no direct customer engagement, these companies build product intuition through trends changing other sectors. Unfortunately, many companies with the “customers don’t know” aren’t actually doing that either. It’s more someone’s whim defining the offering. We respond to questions and issues: In this part of the spectrum, companies may proudly say they listen to their customers. Not too deeply though. It’s more a surface-level valuation of customer input. It doesn’t fundamentally change the company culture, or really draw customer insights more deeply into the organizational workings. The hip companies have extended this work out into social media. They monitor tweets, Facebook posts, Pinterest pins, etc. for complaints, questions and sentiment analysis. We have a Customer Advisory Council: Take some of your best customers, and appoint them to a special panel that meets periodically during the year. Good forum for airing bigger picture issues. In this case, companies asttempt to more directly solicit customer input into their thinking. These sessions are good, because otherwise the only way customer feedback gets into an organization is during the sales process and then one-on-one with an account/customer rep. Insight gets trapped in a CRM account somewhere. 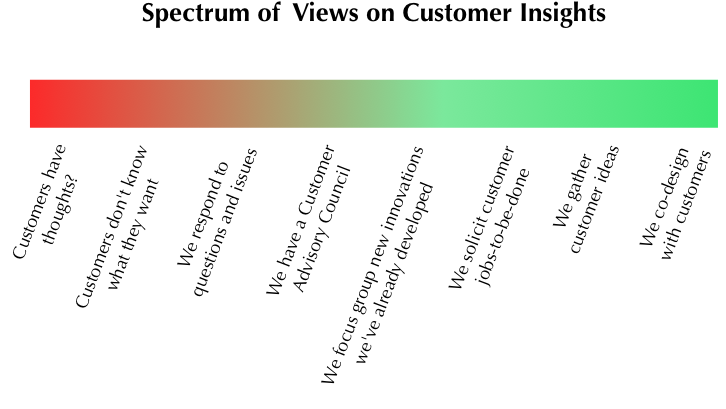 While progressing on being attuned to customer insight, CACs are still siloed affairs. Many in the company have no idea what comes out of them. And they are removed from the day-to-day work that truly defines an organization. We focus group new innovations we’ve already developed: As opposed to developing something and putting it out there, these companies work with focus groups to understand what is liked or disliked about an offering they have developed. This can be quite valuable done right, and becomes a direct conduit for customer insight into the company. The biggest problem here is that it’s after-the-fact: the product or service has already been designed. Now, in the lean startup methodology, this approach of develop and test is a core principle. In corporate land, focus groups may be less about test-and-learn, and more about affirming one’s pre-held views. We solicit customer jobs-to-be-done: As part of their planning and design process, companies solicit customers’ jobs-to-be-done. They want to get a bead on customers are trying to accomplish with their products and services. This is no small feat. I’ve done this work myself, and it does take a willingness to open one’s mind beyond your own personal beliefs. But getting and using jobs-to-be-done in product and service design is a basis for better, more valued offerings to the market. Key here is not just engaging customers on their jobs, but actually incorporating that into design. We gather customer ideas: Customers are using your offerings, and can see opportunities where new features and services would help them. While certainly product, R&D and marketing will come up with ideas on their own, what about the people who actually use your products? This is a form of open innovation. The amount of ingenuity outside your company walls dwarfs what you have internally. Key here is to solicit around focused areas for development, which makes using the ideas more feasible inside companies. Wide open idea sites can be harder for companies to process, as they don’t fit an existing initiative. Defined projects have a receptive audience and a commitment to progress forward. We co-design with customers: The most advanced form of customer-centricity. Customers have a seat at the table in the actual development of products and services. This is, frankly, pretty radical. Their input guides the development, their objections can remove a pet feature favored by an executive. This is hard to pull off, as it is counter to the reason you have employees in the first place (“experts on the offering”). It requires a mentality change from being the primary source of thought to a coordinator and curator. Key here is deciding which customers to involve at what point in the process. My guess is that most companies are still toward the left side of the spectrum, but as I say, it is a changing business world.